February | 2011 | Go Chapel Hill! Chapel Hill Transit (CHT) will begin spring break service on Saturday, March 5. The weekday CM, CW, D, J, NU and V routes will end earlier in the evening. The Saturday/Sunday U & NU routes will not operate. On Sunday, March 13, the U route will begin at 1:50 p.m. at the Carolina Coffee Shop and the NU route will begin at 1:45 p.m. at the PR lot. Safe Rides will operate on Thursday, March 10, through Saturday, March 12. EZ Rider services will end at 10:35 p.m. Monday through Friday. The last scheduled pick-up window will be 10:25 p.m. – 10:45 p.m. Regular service will resume on Monday, March 14. For specific schedule information, please visit http://www.chtransit.org or call a customer service representative at 919-969-4900. 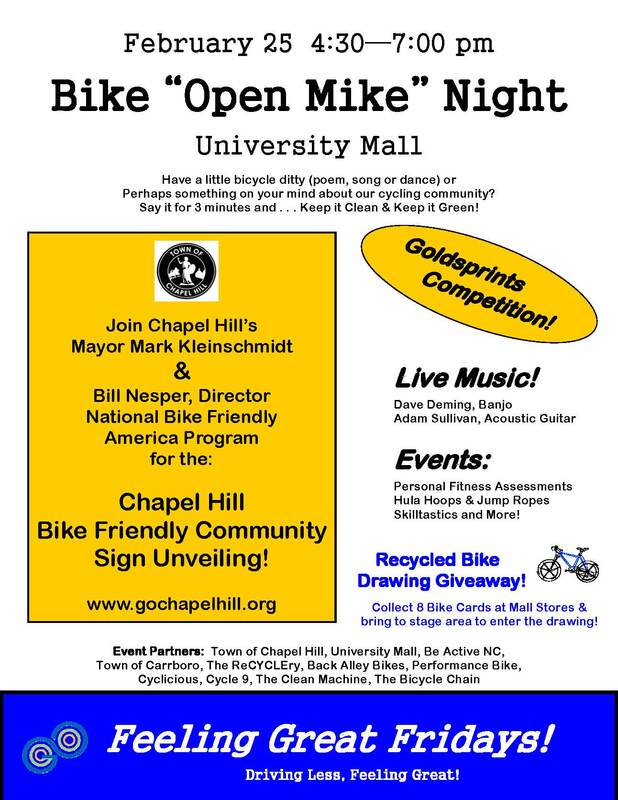 Bike “Open Mike” Night, February 25th!